The National Self Build & Renovation Centre is ideally situated at Lydiard Fields, Great Western way in Swidon. In Swidon, it is the UK’s ONLY permanent centre for self builders & renovators - simply a must see at whatever stage of self build, conversion or renovation you are. Walk through two permanent houses, view cut-away foundations, floors, roofs, septic tanks and much, much, more. See the latest products to enhance your home or renovation project including lighting, sound systems, kitchens and flooring - there are 240+ suppliers in the Trade Village. If you are looking for a truly inspiring venue for your next conference, meeting or function, then look no further than the unique facilities at this centre. 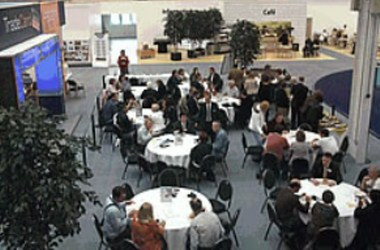 Set within our unique Visitor Centre, our conference facilities offer a distinctive and exciting meeting space to accommodate a range of requirements. We offer a variety of rooms to suit a diverse range of functions such as conferences, seminars and presentations, networking sessions, training sessions, gala dinners, etc.